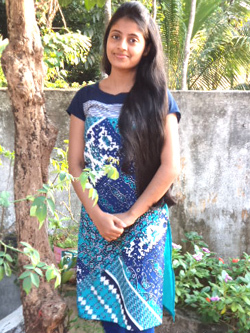 Pheba Miriam John is Syrian Christian- Pentecost daughter of Pr.Yohannan PO, Managing Trustee, Eternity For All Trust Ministries, especially for North India- True to True God, Born Again experience to the new faith in, life & service of Jesus Christ, in accordance to the perfect plan of God, His Word and its principles which never change. Would always like to lead and live an exemplary family life according to the perfect plan of God and to His perfect Word for His own glory. So prayerfully look forward to be united with such a spiritually matured, well educated person who really wants to glorify God in and through personal, family and ministerial life. She is loving and kind. She is interested to listen and sing Christian songs in different languages, especially Malayalam, English and Hindi. Syrian Christian- Pentecost, Who is True to True God, to the new faith in, life & service of Jesus Christ, in accordance to the perfect plan of God, His Word and its principles which never change. Must be a spiritually, and physically matured person who really wants to own, lead and live an exemplary stable personal, family and ministerial life in accordance to the Christian values& principles( Word of God), and to the perfect plan of God for God's own glory.